The Lead Manager, Bell Potter, has advised that they have received firm commitments in excess of the $4 million minimum offer size. OnMarket has a limited allocation and the offer may close early. Australian Family Lawyers (AFL), is an Australian law firm that practices family and relationship law. The firm provides advice to clients in respect of divorce, separation, property and children’s matters together with ancillary services such as litigation, wills and estates. The Family Law market in Australia is worth an estimated $1.1 billion in revenue and is highly fragmented and well suited for consolidation. No family law firm currently has an identified national presence. AFL’s objective is to become the market leading provider of Family Law services in Australia. Innovative client acquisition model – AFL’s client acquisition model utilises digital marketing techniques employed in various industries in a unique way in the context of the legal industry. Overhead cost efficiency – Staff resourcing is dictated by lead generation metrics allowing the workforce to be scaled to match volume of leads. Cost efficiencies also reduces reliance on permanent administrative staff. Upfront revenue model – Clients are engaged on a cost agreement and work is billed throughout the matter rather than a ‘no win no fee’ basis. Scalability – AFL’s client acquisition model is well suited to expansion into new geographies to create Australia’s first national family and relationship law practice. The issuer of the prospectus is Navigator Resources Limited (ASX: NAV), an ASX listed company. Upon completion, NAV will acquire 100% of the issued capital of AF Legal Group Pty Ltd and will change its name to AF Legal Group Ltd and trade under the ticker ASX:AFL. For more information, please refer to the Prospectus. AF Legal Group Ltd is seeking to raise between $4 million and $6.5 million and will have a market capitalisation of approximately $12.6 million at maximum subscription. assist the Company in re-complying with the ASX Listing Rules. Family law services involve matters concerning the family court, such as divorce, property settlement and children’s matters. AFL research indicates that the Family Law market size is approximately $1.1 billion per annum in fees, or 15.5% of the $7 billion Personal Legal Services market. Divorces, and the breakdown of de-facto relationships largely account for the demand for law firms and practitioners that specialise in family law. The total number of divorces granted in 2017 was 49,032. Although this level has remained relatively stable over the last 10 years, growth in the breakdown of de-facto relationships and increasing levels of household wealth will likely drive increasing demand for family law services. The Australian legal services market remains highly fragmented. The level of fragmentation is even more pronounced in the Personal Legal Services market, and its Family Law segment. In contrast to the personal injury sector in Australia which has a number of dominant and high-profile market players (e.g. Slater & Gordon, Shine and Maurice Blackburn), there is no dominant or national player in the family law market. This is despite the fact that the two markets are of a similar size. 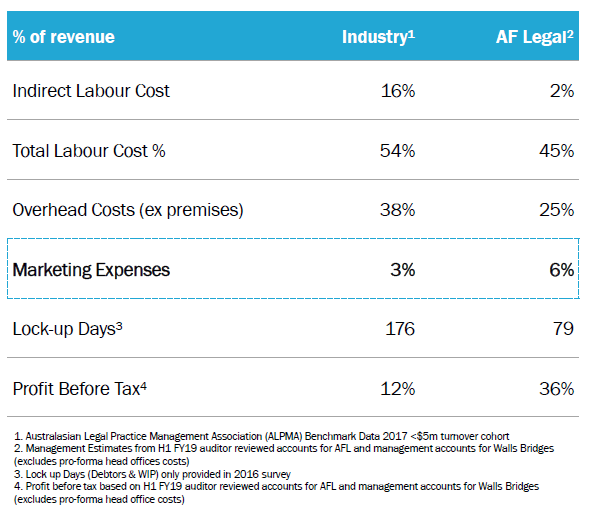 This contrasting phenomenon highlights the unique opportunity that exists for AFL to lead consolidation in the sector and become the first player of scale in the family law market in Australia. AFL believes that its business model is clearly differentiated from traditional legal firms, and challenges the conventional wisdom of relationship business development. AFL’s points of difference drive superior financial performance to its peers as benchmarked against the Australasian Legal Practice Management Association (ALPMA) 2017 survey conducted by Crowe Horwath. A summary of the results for the industry cohort of less than $5m turnover is shown below. lack of requirement for large business development teams to generate work. 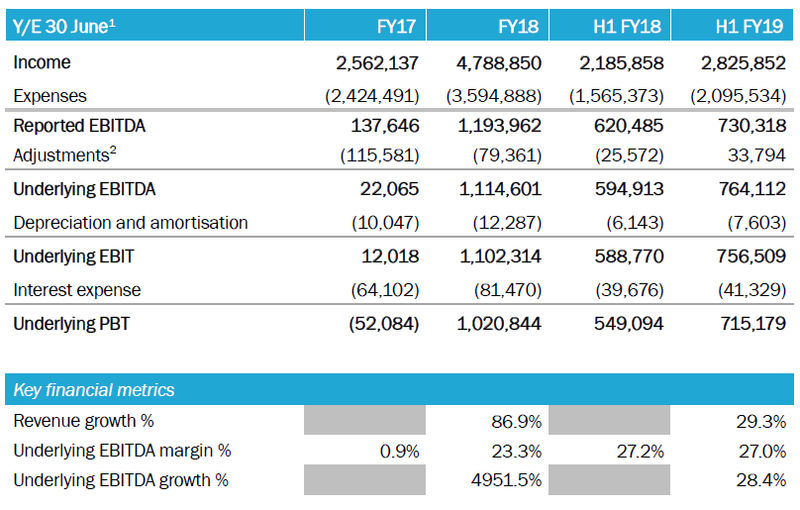 A summary is provided below of the historical performance of AF Legal Group (excluding NAV) on a reported and underlying basis. Edward Finn (MD and Founder). Founded the firm in 2015 after identifying the opportunity to launch a disruptive model in family law, previously worked in family law at Alpass & Associates and admitted as a Solicitor in 2012. Edward is the recipient of the Grummitt Scholarship. Grant Dearlove (Executive Chairman), with 27 years’ experience as lawyer, company director and business owner / builder, Grant has been a practising solicitor since 1992, an equity partner with McInnes Wilson Lawyers and the last 9 years with Shine Corporate leading their emerging practice areas, growing new areas from $2m to $50m in revenue. Grant held prior positions as MD of PRDnationwide and Verifact and NED of Oliver Hume Corporation. Glen Dobbie (Proposed Non-Executive Director) has over 10 years’ experience as an investor, advisor and operator in the corporate mid market, including senior roles in both public and unlisted markets in industries such as private equity, education, media, infrastructure, engineering, waste management and technology businesses. Glen is currently the Managing Partner of Auxano LLP, an investment and advisory firm that operates throughout Asia. Prior to Auxano, Mr Dobbie was the Group Commercial Director at Arowana. You are encouraged to read the Prospectus carefully as it contains detailed information about the Company and the Offer. Like all investments, an investment in the Company carries risk. AF Legal Group Ltd is subject to a range of risks, including risks associated with the reliance on marketing strategy, regulatory environment and legal reform, reliance on key personnel, failure to retain or attract clients and operating in a competitive market. Please refer to Section 5 of the prospectus for further details. OnMarket has a limited allocation. The offer may close early and the 'Pay By' dates may change. Bids over $10,000 may be scaled back more heavily. Duplicate bids under the same investment profile, investor name or residential address may be cancelled. Tap 'More Info' to get access to free research, all company releases, and invest instantly for shares.